As gardeners, we tend to know most plants by sight, but the primary associations of certain plants derive from a sense other than vision. 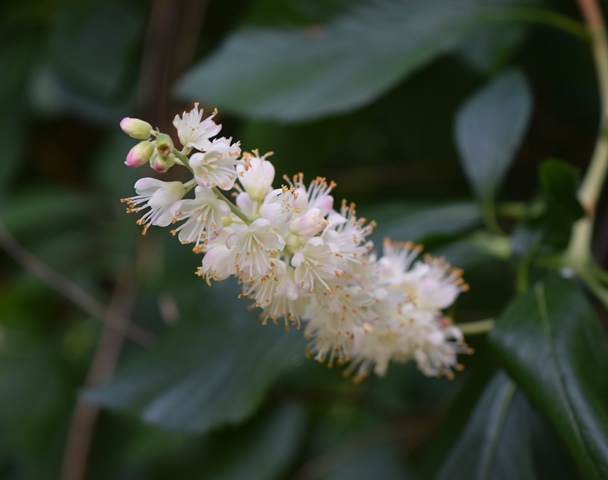 Chief among these are plants with fragrant flowers, where Clethra acuminata scores high marks and evokes strong memories. This native of moist mountain woods in the southeastern U.S. forms a large deciduous shrub, eight to 20 feet tall. Its rich green, lance-shaped leaves are held attractively on tiered branches, turning a lovely golden yellow in fall. On mature plants, winter reveals reddish brown bark peeling in irregular patches to expose cinnamon colored inner bark. Hypnotic fragrance: But it is the fragrance of its summer flowers for which we remember this plant. Often smelled before they are seen, the slender, drooping bottlebrushes of small ivory flowers release a spicy and hypnotic perfume, kindling memories of summer thunder storms, long-gone summer vacation days, or maybe a hookah smoking caterpillar during the “summer of love.” No matter how you spent your summers, the mountain pepper bush is fondly associated with this time of year. So when the Seattle weather finally gets hot in late July and August, go in search of this fragrant denizen of cool woodland. Where in the Arb: The Arboretum’s sole specimen can be found on the Lookout Loop trail, by the Asiatic Maples Collection.